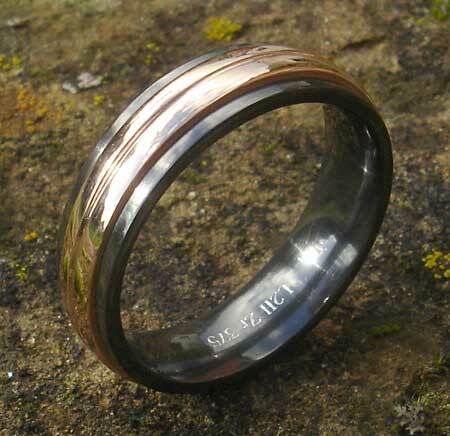 Unusual Rose Gold Inlaid Wedding Ring : LOVE2HAVE in the UK! If you are looking for an unusual wedding ring that has to look modern too then, this is the ring for you. This ring is a zirconium ring with a 9ct rose gold inlay. The gold inlay is shaped with a central groove and being black this ring makes an excellent men's wedding ring. It measures 6mm wide, and the inlay is slightly pronounced from the ring to give it an almost domed shape appearance. We have it pictured here in a polished finish which shows the gold off to its best. It is unique, and we think you would be hard-pressed to find this particular wedding ring featured in your local jeweller. Zirconium wedding rings make an excellent alternative cost-effective choice. 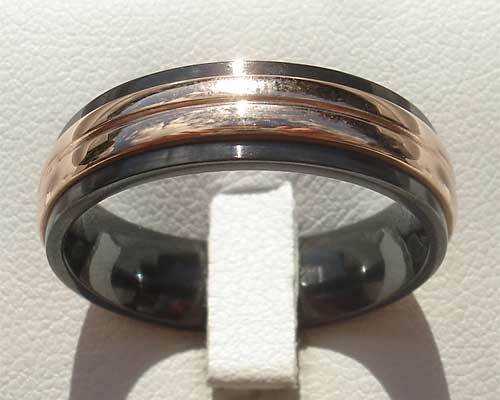 Metal(s)/Material(s) Available: Zirconium and 9ct rose gold.